Rotary Club of Kuching Central (RCKC) is proud to announce that we will be organising a Charity Run to raise funds that will supplement our numerous community projects to be undertaken in the Rotary year of 2017-18. RCKC has been active in assisting the less fortunate in our society as well as carrying out targeted Youth Development Programs over the past 30 years. This is also in line with this Rotary year’s objective of “MAKING A DIFFERENCE”. 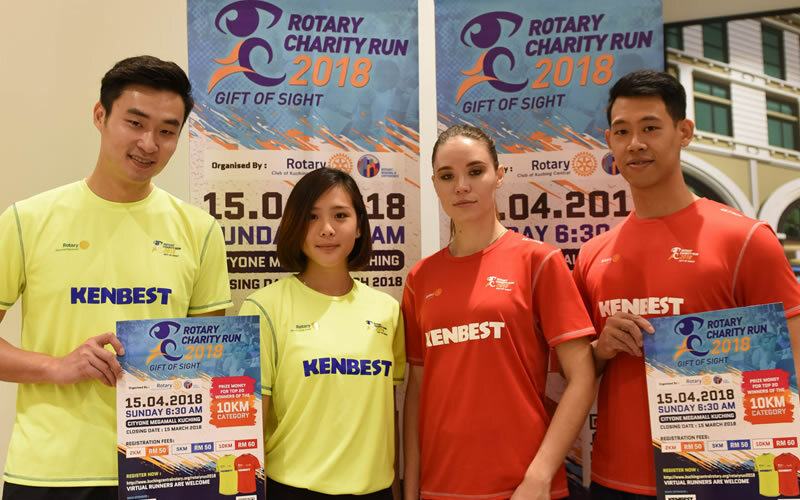 This year, the run’s proceeds will be directed towards prevention of blindness activities such as free cataract operations for low income beneficiaries from rural areas of Sarawak, free eye screenings, and more. The announcement was officiated with the launch of the event on 22nd October 2017 at the Gallery, CityONE Megamall Kuching with Guest of Honour, DG Datuk Lee Chuen Wan, District Governor of District 3310 of Rotary International. He was accompanied by RCKC President Mr Benjamin Lo, Organising Chair Mr Jong Kiam Ngee, and Assistant Governor Dato’ Thomas Ngu. Mr Stephen Long, the Managing Director, and Mr Jonathan Long, Director of Kenbest Sdn Bhd, as well as Mr. Brandon Lo, General Manager of CityONE Megamall also witnessed the launch together with Rotarians from RCKC and all other Rotary Clubs in Kuching. This is the 2nd year RCKC is organizing this run, and it has three categories of 2km, 5km, and 10km to cater to a wide range of leisure, as well as more dedicated runners. We aim to register a total of 5,000 participants to create extensive publicity for Rotary and our sponsors. The Run will commence at 6.15 a.m. at CityONE Megamall, Jalan Song, Kuching on 15th April 2018. Every participant will receive one piece of uniquely designed dry fit “Ultron” t-shirt upon signing up, and a beautifully designed finisher medal upon completion of the Run. Prize money will be awarded to the top 20 finishers/winners for 10km men and women categories. As a sign of appreciation for the public’s support, the first 100 sign-ups will receive a special mystery Early Bird gift. Registration will be performed via online registration at http://www.kuchingcentralrotary.org/rotaryrun2018. Roadshow counters to accept on the spot registration will also be set-up. Details will be announced on the RCKC Facebook page at http://www.facebook.com/kuchingcentral.